SETUP: Attach a rope handle to a high cable pulley; it's easiest to use one inside a cable-crossover station. 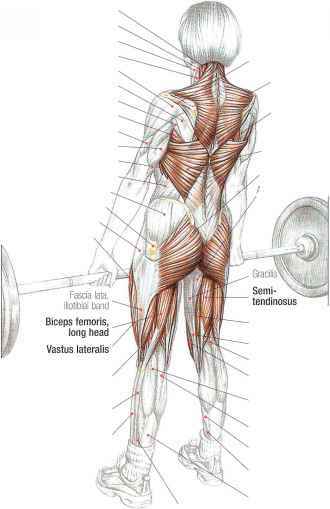 Stand sideways to the weight stack so your right shoulder faces the weight stack. Grab the rope with both hands and stand far enough away so you have full tension in the cable with your arms straight. Your left arm is reaching across your chest at this point. You want your lower body in an athletic posture—feet shoulder-width apart, knees bent slightly, lower back in its natural arch—and your head turned so your eyes are on your hands, up and to your right. LIFTING: Pull the rope down and across your body, to just outside your left knee. Your eyes should follow your hands. This is a fast, powerful motion. LOWERING: Return the cable to the starting position. 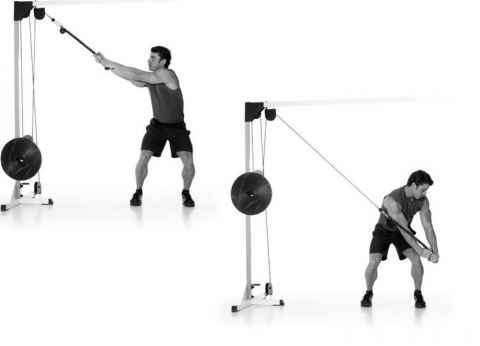 Finish your reps and then switch sides, pulling to your right.